Envoy from Morocco in 1608. He delivered to Maurice of Nassau, governor-general of the Netherlands, credentials from Muley Zaidan, sherif of Morocco, testifying Belias to be "ministrum Regiæ nostræ sublimis, qui negotiis ejus diligenter incumbit, resque ejus curat." 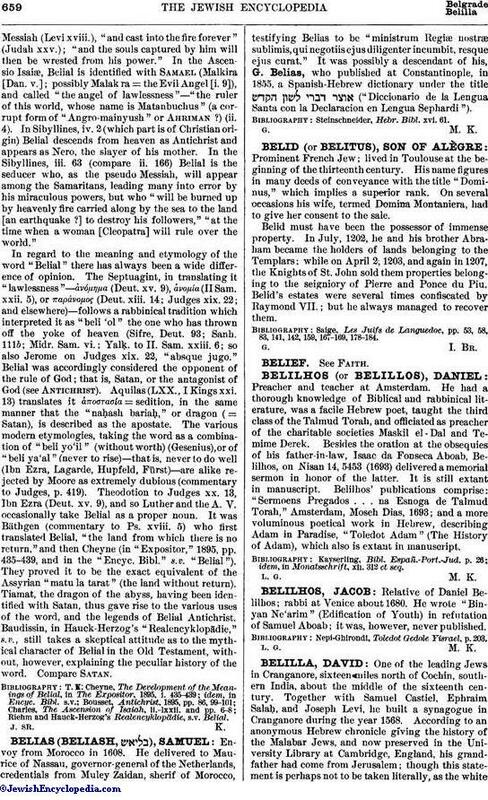 It was possibly a descendant of his, G. Belias, who published at Constantinople, in 1855, a Spanish-Hebrew dictionary under the title ("Diccionario de la Lengua Santa con la Declaracion en Lengua Sephardi"). Steinschneider, Hebr. Bibl. xvi. 61.